Who is it for? Miss Claire Matte and Pearly Gloss 113 is For those looking for a gloss in a light pink shade. So in terms of the packaging, it’s just a basic pink bottle with a black screw on cover. It has the brand and shade number mentioned on it. I’m not very impressed with it but for the price that it comes at, I can’t be complaining. When I saw the product, I didn’t think much of it. But when I swatched it, I was quite impressed. 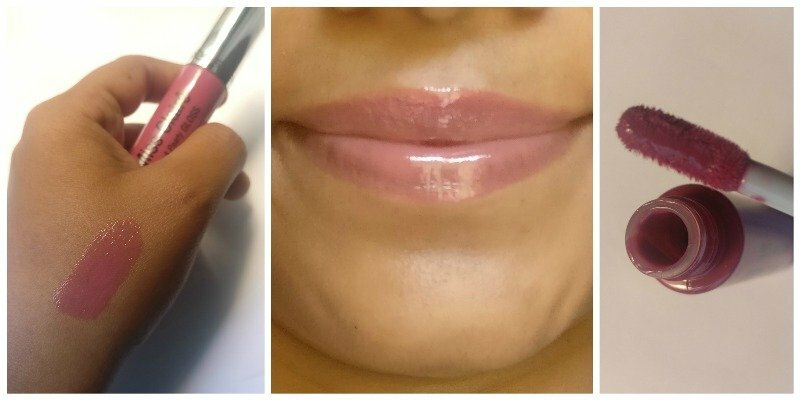 It is a lovely pink shade that will suit most skin tones. It has a very soft and creamy texture to it and that helps the product glide on easily. The tube comes with an attached applicator which is really convenient. Application is very easy with it. Although it says it’s a Matte & Pearly Gloss, I see no matte effect. It isn’t too sticky but it does have a gloss finish to it. Very affordable. I think INR 125 for a gloss is amazing and super reasonable. Because it’s not too sticky, it doesn’t fade off quickly. It isn’t transfer proof though. What do I not like? Would I repurchase & recommend?